Maybe they should throw rocks and shoot it with a 22. That would probably make any bigfoot just angry enough to rip all of their arms off so they wouldn't be able to throw rocks or shoot at bigfeets anymore. Oh yes I seen this. Forgot the baby was in it. Is it a real bigfoot do you think? I don't know, Shami. With all the fake videos and the stupid hoaxers that are out there I don't trust any video any more. Stupid hoaxers. Some of the skeptics are suggesting that it might have been a man carrying some kind of a monkey or ape but I don't think that is true. I would say that if it is a real video it probably is a real bigfoot. There are lots of reports of bigfeets climbing trees. Ok this was caught on a trail cam in the lower peninsula in michigan.... about a hour north of Detroit... I caught this on my trail cam.. But i seen this same Figure with 3 other people at a local place around here about 5 miles from where this trail cam was caught.. It was at a nature reservation i was there fishing on the lake and no one goes there besides fisherman and i seen this exact figure walking.. and we all looked at one another and said WTF WAS THAT.. we did not know.. I am a avid hunter and i am not sure.. there are no black bears down here.. so i am confused.. please help me understand what this is.. thank you.. Interesting. Kelly and I watched Bigfoot episodes throughout the night last night and we had a long conversation about our beliefs pertaining to ufo's/alien's, bigfoot, ghosts, fairies,mermaids, and the like. I told her that after having some of the past experiences that I have learned to doubt nothing . She agrees. Since being with me for the last 4 1/2 years and seeing the objects filling the sky ( I don't even consider that a sighting anymore but I still don't know what it was ) among other things I've showed her and we've had conversations about in the past, she has had a change of heart in her beliefs. She no longer doubts and knows there is something to all of this . If I were to guess after thinking about this Bigfoot phenomena for quite some time and seeing all the witnesses and reports, I would estimate that with all the sightings around the world that there is most likely about 100 or more of these primates living throughout the North American continent. If they do exist, they probably are both carnivorous and herbivores and most likely migrate within a 500 mile area . North in the summer, south in the winter. Just a personal hunch and based only on what I've heard. I've never seen one ,,,,, yet. I'm still on the fence about this also with some skepticism. Many of the witnesses seem genuine. Bigfoot supposedly filmed in Alaska. This looks to me like another shaky camera filming another blurry blob behind a blurry bunch of trees. What do y'all think? I could see it was a black hairy figure but mostly the top half of his body. Did not seem tall but who can judge if you do not know the height of the trees and brush?? This guy seems scared. And someone was with him. That is one thing you would.. do yell for your friend. Thus far no one has been attached by a bigfoot. A woman in Canada told about how she seen a bigfoot in her back yard and he child was out swinging in the swing. She ran out to grabbed the child while the bigfoot was tangled in her cloths on the clothes line. It showed a Documentary on it years and years ago. Never forgot it. She seen it's entire body. She said it was taller than the top rail on the swing set. What ever that may be. I would never go out searching for one of these creatures. This is exciting! It might (JUST MIGHT) be hard proof!!!!!!!!!! Nice ! I'm hoping other forensics examiners will get on board with these samples and test them to give confirmation as to their existence. I would think with a new species such as this that it would be all over the scientific community and mentioned in journals everywhere. Time will soon tell. If the results of the DNA tests are correct then Bigfoot is a hybrid offspring of a human and an "unknown" hominid. They claim the hybridization took place approximately 15,000 years ago. The question that I would naturally have is what "unknown hominid" species are they talking about? Could it be another bigfoot species? Perhaps there is a population of pure-bred bigfeet as well as another population of hybrid human/bigfoot which evolved from interactions between the two species. I wonder if this hybridization was consensual or was it the result of some forced breeding experiments? Ancient scientists dabbling with ancient genetics? Or something else perhaps? I find it very interesting that the starchild skull was also determined to be a hybrid human species that supposedly evolved from a human mother and an unknown father. What are these "unknowns" that keep popping up? Could it be ET visitors experimenting on hapless human abductees that result in these weird creations? Whatever the case may be there was something very weird going on thousands of years ago. Probably just as weird as what's going on today. November 27, 2012, 4:47 p.m.
A Texas veterinarian-researcher claims to have shown that the elusive creature known as Bigfootor Sasquatch is a human hybrid, descended from human females who mated with males of “an unknown hominin species.” In a statement released on Saturday, Melba S. Ketchum said that her conclusions emerged after she sequenced samples of purported Sasquatch DNA. “Genetically, the Sasquatch are a human hybrid with unambiguously modern human maternal ancestry,” Ketchum said in the statement. 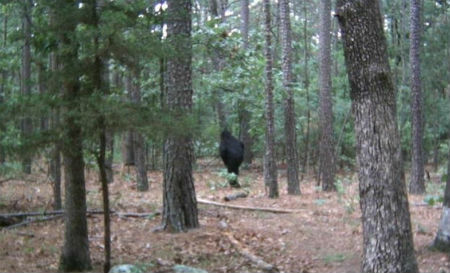 This is Bigfoot we’re talking about, a creature that has never definitively been observed, despite decades (centuries?) of reported sightings. Over the years, Los Angeles Times reporters Kim Murphy and Eric Bailey both wrote about scientific and not-so-scientific searches for the possibly mythical man-beast. A related problem: As no one has yet seen or captured or exhumed a Sasquatch, many question whether Ketchum’s samples actually came from such an animal. Ketchum’s statement did not describe where she got her DNA samples. It seems the skeptics are already trying to debunk this and it hasn't even been released yet. I'm going to withhold judgement until I see all the data and info on where the samples came from and exactly how the testing was done. It does sound interesting so far though. The idea that bigfeet might be closely related to humans kind of ties in with what I have been saying lately...that they seem to be a lot more human in behavior than animal. These creatures seem to be a lot smarter than people give them credit for which may explain why it is so hard to find them. If an intelligent species of being that lives in remote wilderness areas did not want to be found do you think anybody would find them? If somebody went into a jungle looking for members of a special forces military recon team would anybody be able to find them if they did not want to be found? It's not that difficult to stay hidden. I'm really starting to wonder just how intelligent these things really are. In human evolution the ability to stand upright occurred in conjunction with an increase in brain size and capacity. The larger the head is the more upright a being would need to be in order to support the increased weight. Since bigfeet also walk upright would they therefor also have a larger brain and increased intelligence? In all likelihood it would appear so. Why would "Government at all levels" protect a half-human being? There are full human aboriginals in the Amazon Basin whose houses are being knocked down by giant chains slung between two mega-tractors. Their creeks running with pesticides and poisons and the rain forest that sustains them ripped down. No one is terribly excited about this - have to grow those gmo soybeans for hog feed sold in Europe ya'know. Children intentionally doused with insecticide who die with no repercussions to the agri-business farms. Susquatch? If they exist its because they don't trust us. Nor should they. The government spends all its time trying to gain power and control over people. If the Feds found out Bigfoot was half-human they would probably raise taxes on them and force them to buy health insurance. Maybe Bigfoot would be better off if we didn't prove he was real. So true. There may come a day when I run and hide with them. That's not a bad idea, Cliff. I think bigfeets would make good friends. I wonder if they could teach me to hide from the IRS? I'm still singing the same tune here. I think another race has brought them here from time to time. Maybe where ever they have been brought from, their own dwelling places as it's life source there for them is diminishing.. I would never want this planet over populated with these man animal creature ..
Years ago, before I began ET presence studies, I was affiliated with a small funded group of Big-Foot investigators. This was back in 1974. I had only a (mostly clueless) passing interest in ET subjects at the time. I won't bore you with all the gorey details, but rather, that during my association with these folks, it was occasionally mentioned, that preceding the rare authentic yeti, sasquatch, and big-foot sightings that often in the approximate area of the big-foot observation, that there were also disc sightings seen by others, and generally, not by both. Occasionally the buzz was that it might be possible that big-foot could be a pet, that the pilots of the disc allow to go out for a pee, or that maybe, the presence of the disc, as a possible artifact of the propulsion system, creates an accidental dimensional portal, through which big-foot passes from a parallel world. After my close encounter, I read everything on the book shelves and found this one book to be very interesting. It was all I could do. I never heard of Mufon at this time. There was no one who was going to listen to what I had experienced. But this one book told of a rancher who lived some where in Wyoming or Montana . He had ufos continuously bugging him and his property. It really got bad. He told the Sheriff who came out at each event and found nothing. One night a ship was hovering right over his front yard and when he and his wife went out and seen the ship, he told her to stay on the porch while he went out to it. His wife was engulfed in a blue beam and could not move while he was taken. Hours later he was dropped onto some kind of pile , maybe hay . I do not remember.. He ran to the porch and his wife was laying there still passed out. I told this on Mufon forum years ago. I have never found the book again. Anyway one night he seen a ship up on the mountain near his home. He immediately got in his jeep and went up the mountain. He got close enough to where he could walk to a clearing that was bathe in light. He told of a ufo sitting on the ground with a large opening and walkway coming down. He said a Bigfoot was carrying a triangular purple box. He was getting very nervous and wanted to leave. He watched a minute longer while this Bigfoot walked to the middle of the clearing and sat the purple triangular box down. He said it started glowing very bright and gave off a order he was not familiar with. He then ran. Took the Sheriff to the location, but nothing was found. The book contained many photos of his property and the locations of his sightings. Once a ship turned his TV on. Now the Sheriff did not think much of this. But he swore the TV was not even plugged into the wall at the time. This took place in the mid 70s . My experience was in 72 and not long after I found this book . First thing that happen was Walton's close encounter. Was I ever glad to hear this news. I showed the magazine to my family and friends. They said this guy must of had the same dream as you.. Later I read the book. I have tried to find it. but without a title and Author it is impossible. I did not purchase this book . It was at our local Library. I felt this victim to be telling the truth. I have never forgotten his encounter with a Bigfoot in this manner. I remember by sight.. I can still see this man's face. He had dark hair and a mustache.. Age middle 30s. Average height and built. Some how I keep seeing the word West.. when I try and remember. . He wrote the book .. maybe West was his name?? Do they like to eat corn? Maybe the two of them one much smaller than the other walked in the rows of corn and accidentally found our grove. ;D By the way you can look it up .. It is Funks Grove. The two men Father and Son was the witnesses. They had seen a Bigfoot in the Grove a year before but did not report it of fear of ridicule. The second time, they knew what they were witnessing was real. But still the towns folks did not believe them. Investigators from all over came here. When Stars Wars came out a few years later in 79. I could not believe what I was seeing.. A Bigfoot flying a space ship. So funny I thought .. How did the writer know? Swamprat . you know this area. Do you think a Bigfoot could live here all the time? A photo of Funks Grove when US 66 ran through it. ;D Don't blink..
My great grandfather came here from Scotland in 1833. His home sat in Funks Grove . He was the only landowner besides Funk himself to own a piece of property here. He finally moved his farm to another location just to the East of Funks Grove. This link shows a Investigator who came here setting up a camera in the Groves. I get it every time but the stupid link does not work.. I give up. here is a article from our news paper. Even the zoologist from our College states a bigfoot could not survive in Funks Grove.